The IoT doesn’t appear on award-winning TV that often, but if you liked the TV series “Breaking Bad”, you might also be watching its prequel, “Better Call Saul”. Without giving away the plot, this season a small, long-range GPS tracking device is prominently featured in multiple episodes and, well, the battery doesn’t last very long. You can watch for yourself — I highly recommend it for both the screenwriting and the acting — but I’m glad to see the issue getting popular visibility because in the LPWAN (Low Power Wide Area Network) corner of the IoT where some of us live, we have yet to have “the talk” about a huge challenge: GPS melts LPWAN battery life. So this piece is about implementing GPS in the low power IoT. As you probably know, LPWAN’s are supposed to be low power devices which implies … no AC power connection. If you are thinking about fixed or non-mobile LPWAN endpoints, then you have no need for GPS and reading this article is probably a distraction from being productive. But if you are deploying mobile LPWAN endpoints, read on. A major use case for LPWAN’s is what analysts boringly refer to as “asset tracking”. In my native pleb-speak this translates to “where is my stuff?” Tools, dogs, cows, bicycles, weapons, shipping containers, Alzheimer’s patients … the list of asset tracking use cases is extremely long. I’ve touched on locating things in the IoT here and here and I’ve noticed how some LPWAN technologies make ridiculous claims about their ability to locate things outdoors. But here’s a fact: deploying GPS on an LPWAN device is hard. Many developers think they know how GPS works but if you have doubts and think you could use a refresher, try this. To compute its location, an IoT device needs to acquire GPS signals from at least three but ideally four out of 32 GPS satellites orbiting the earth. But what most also don’t know is that GPS is a very slow communication channel — just 50 bps! — which means the amount of time your little mobile LPWAN device must be “on” in order to receive GPS messages (technically 37,500 bits per message, per satellite) can be multiple minutes in order to acquire the GPS coordinates being sought. We could pick on Sigfox here, but that would be too easy so let’s further illustrate the battery impact of GPS on an LPWAN device by assuming you are using a one-way LPWAN networking stack for Semtech LoRa devices called LoRaWAN. Since it’s a one-way device, assume it emits a periodic one-way beacon with GPS coordinates every 30 minutes to track a valuable piece of construction equipment at a job site. Why use a beacon? Because with a one-way protocol like LoRaWAN there is no way to query “Where is my chainsaw?” if the chainsaw goes missing. So assuming an acquisition time of 2 minutes for all four satellites multiplied by 48 times per day, your GPS module is already working a total of more than 1.5 hours a day. Divide the 1,000 hours of your AA battery by 1.5 hours of GPS duty per day and you might get just over one month of battery life. Flutter. If your LPWAN device has an obstructed view of a satellite (chainsaws may be locked in a shed or the passenger seat of a pickup truck) or the device is moving (highway overpasses, tall buildings, etc.) a GPS receiver can experience “flutter”, causing the receiver to work overtime to search for error-free GPS packets. If the flutter is bad enough, this can take a LONG TIME and further deplete your battery in the process. GPS “idling”. GPS receivers don’t do a good job of retaining satellite location information while in a low power state. If you want to keep satellite location data fresh in your mobile device’s memory so that the next time your device tries to acquire GPS info it can do it faster, you’ll need to budget a continual flow of power — approximately 0.44 milliamps on average — or risk needing to acquire GPS from a “cold start”. GPS satellite info has a shelf-life of four hours so at a minimum you will need “fresh” satellite info at that interval. The 0.44 milliamp average is a weighted average of idle power and GPS on time for a system sampling GPS every 30 minutes. The radio. 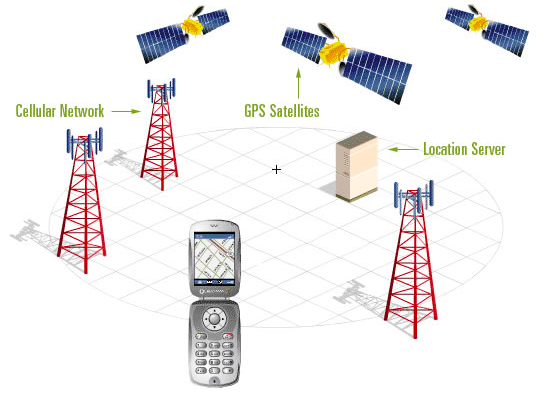 Acquiring GPS coordinates is not enough as you’ll have to transmit them to a gateway. This is in addition to any other messaging your device might do. The MCU and the rest. Your mobile device needs to do everyday computing tasks managing whatever onboard sensors, radios, memory, etc. it is carrying. This burns battery life. So it’s no wonder we haven’t seen more action with GPS and LPWAN’s. Practically speaking, for most LPWAN protocols (but not all! ), GPS is like going swimming with a 35-pound kettlebell tied to your ankle. I’ll explain how to overcome GPS hell on an LPWAN device below, but the first step in getting around the seemingly massive obstacles starts by not using GPS at all. Instead, we recommend allowing a gateway to take received signal strength indicator (RSSI) measurements from a mobile device and in some cases trilaterating (similar to triangulation) their measurements using multiple gateways. Our experience with trilateration is that the accuracy of the estimated location can vary from surprisingly accurate — say, within 25 meters — or wildly off — by a mile or more— depending on the number of available gateways, terrain, RF environment, movement of the mobile device or the gateway, and more. There’s nothing wrong with RSSI-based trilateration, in fact we recommend it as part of your outdoor (and indoor) location technology portfolio, but implemented with one-way LPWAN protocols won’t work for most of us. Haystack does this with DASH7 in a far more efficient and relevant way, as you’ll see below. Rarely or never is the question: “I am looking for my champion Poodle, but hey no rush! Just get back to me with an approximate location sometime in the next 30 minutes or the next day and that will be just fine …” No, the question is almost invariably “I need to find my Poodle … RIGHT NOW.” And for most use cases, the end user wants to repeat the question again two minutes later. And again. And again. When you think about it, anything that is mobile that is worth enabling with an LPWAN tracking device is usually valuable enough to require asking this question and receiving an answer in real-time. Unless you don’t really love your Poodle. So at Haystack we’ve invented a portfolio of solutions to help the LPWAN + GPS community that are uniquely achievable via the networking firmware stack Haystack invented and patented, DASH7. I’ve written before about the importance of allowing endpoints to remain in a “listen-before-talk” mode rather than engaging in constant chattering and needless handshaking. Benefits include power savings, real-time queries, real-time location, better privacy and security options, and more. But when dealing with a feature as power-intensive as GPS, on-demand capabilities become paramount. As a first step in answering the “where is it right now?” question, we recommend starting with an on-demand RSSI query. Rather than invoking GPS on a mobile device, it may just be more practical to “probe” for a device’s location using a simple test of signal strength from a gateway that serves as a proxy for whether the mobile object (in the above use case, a chainsaw) is within an acceptable distance from the gateway/access point. A strong signal whose value is ≥x may give an owner peace of mind that the chainsaw is nearby. A weaker signal whose value is ≤x might trigger either a trilateration sequence, e.g. for a device that is moving use repeated queries to the mobile device to measure changes in signal strength and for a fixed device use either a mobile gateway or multiple gateways. 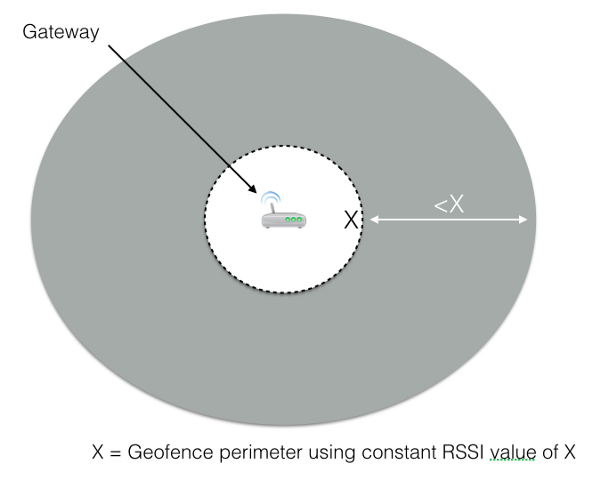 For those of you familiar with geofences, it’s possible to construct one using RSSI values. If your on-demand RSSI query shows a signal that is ≤x (i.e. meaning it is located somewhere outside your geofence) and you want more precise location coordinates, you can invoke a GPS receiver on an LPWAN device. It’s important to repeat that 750 days battery life modeled here is theoretical and doesn’t take into account flutter, other device duties, etc. but using an on-demand (real-time query) approach to invoking GPS is vastly better than the concept of the same device acquiring and beaconing GPS coordinates at preset intervals. But let’s say you are modeling GPS usage for an upcoming LPWAN project but you are concerned that the end users you have in mind might not read your documentation that says to use GPS sparingly and instead might pummel the battery with nonstop queries. Think lost dementia patients, lost family dogs, a lost vintage Fender Stratocaster pre-performance at Lollapalooza, etc. Or that obstructions might be more common than normal and acquisition times might be longer. Even on-demand GPS (along with on-demand RSSI probing or geofencing) with Haystack might not be enough to prevent a fast dead battery. Basically A-GPS is a way of providing information to an LPWAN device, via a gateway, to help it acquire GPS satellite coordinates much more quickly than without A-GPS. As in, shrinking acquisition and processing time from 2 minutes to 20 seconds. A-GPS information includes information about the location of all 32 satellites orbiting the earth for a given time of day and location, time, satellite health information, etc. The total data payload is typically around 1KB. A-GPS is used extensively in cellular telephony and is one of the reasons it doesn’t take your iPhone two minutes to acquire GPS coordinates when you use Apple Maps. But to send A-GPS information to mobile LPWAN devices requires a fully two-way networking communications protocol, preferably with robust multicast and broadcast capabilities, like the kind you get with Haystack. For example, rather than have a group of LPWAN cow tracking devices attempting unassisted GPS location acquisition, a DASH7 gateway can simply multicast A-GPS information as it becomes available. Endpoints could request A-GPS information individually but multicast is faster and more efficient. 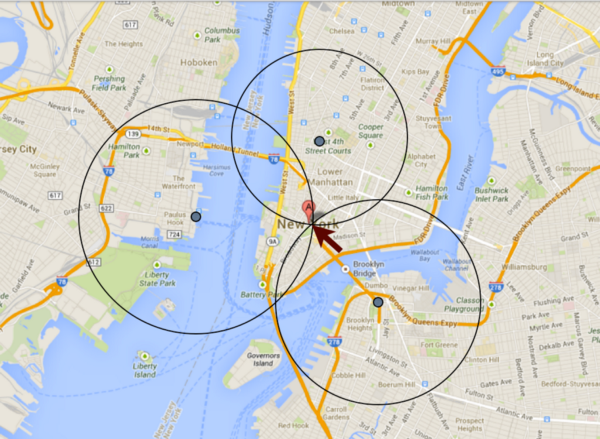 There are multiple providers of A-GPS information that your LPWAN gateway can access. Here’s one from u-Blox who offer their A-GPS location services free to their OEM customers. Needless to say, we are big advocates of A-GPS for LPWAN’s for those customers looking for high precision outdoor location. Coin cell batteries are generally not designed for long discharges. I haven’t seen any LoRaWAN + GPS devices with coin cell batteries and I doubt that I ever will. If you plan to deploy location-based services with your LPWAN, your choice of networking protocol has major consequences in terms of basic feature set, performance, and the breadth of use cases you can support. If you plan to deploy GPS over an LPWAN, there are few downsides to deploying A-GPS and plenty of upsides. If you are in an outdoor or indoor location jam and need someone to talk to, email me at pat at haystacktechnologies dot com or visit our website.